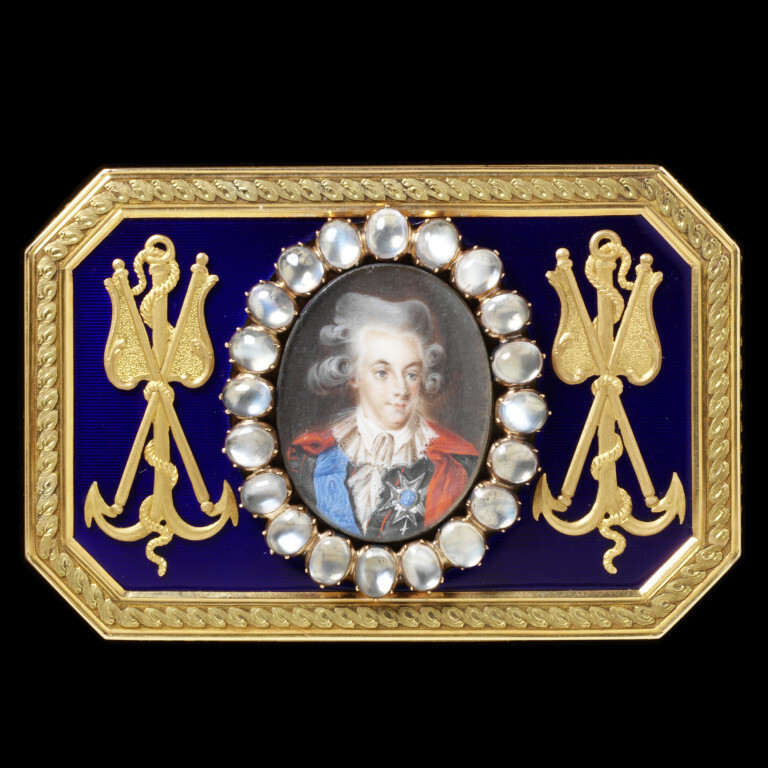 King Gustavus III of Sweden (1746-92) gave this box to Patrick Miller of Dalswinton (1731-1815), banker and inventor, no earlier than 1791, the date the box was made. Gustavus III died in 1792 of an infected wound following an assassination attempt at a masked ball. The box was a gift made in return for Miller's double-hulled ship with a paddle wheel, which is depicted on the base. Miller gave the ship, the paddle turned by manpower, to Gustavus III and it became known in Sweden as 'the British sea monster'. Miller moved on from his man-powered vessels to experiment with the application of steam power to boats. He is also remembered as a patron of the poet Robert Burns. 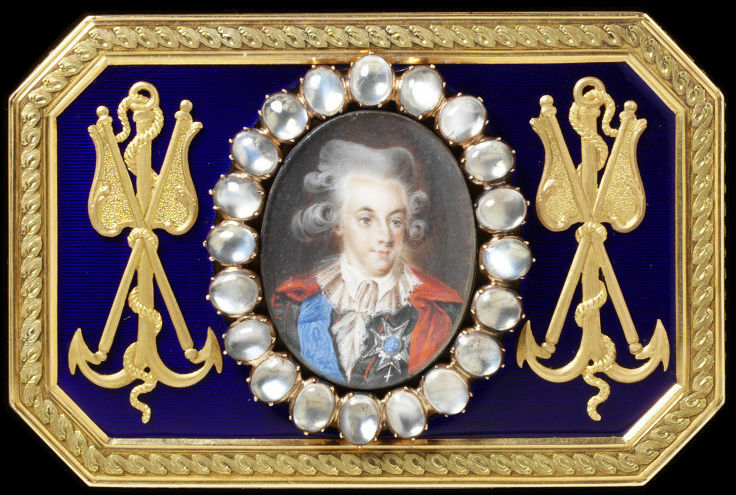 Enamelled gold box, set with a miniature in watercolour on ivory under glass of Gustavus III of Sweden (1746-1792), surrounded by moonstones. On the base is mounted a miniature of a double-hulled paddle-wheeled ship. On the front side is mounted a view of a harbour with warships which has been identified as the Swedish naval port of Karlskrona. On the joint (hinge) side of the box is a scene of a fortification which has been identified as Sveaborg, the Swedish fort which is now part of Helsinki. One end of the box is mounted with a painting of a Swedish gun barge, the other with a Swedish frigate. Engraved on reverse of lid. Inscription not contemporary with presentation. Given by Gustavus III of Sweden to Patrick Miller of Dalswinton, whose paddle-wheeled ship is depicted. 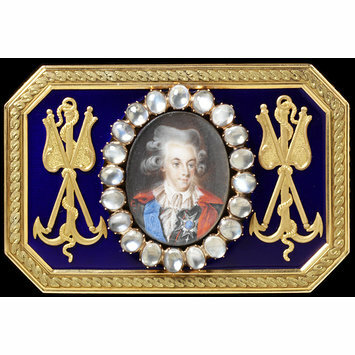 Enamelled gold box, set with a miniature of Gustavus III of Sweden (1746-1792), surrounded by moonstones, with a depiction of a double-hulled paddle-wheeled ship on the base of the box. Mark of Friedrich Fyrwald, Stockholm, 1791.